Got poop? You need Scoops! Scoops Pet Waste Management is a full service Pooper Scooper Service. We provide yard clean up and cat litter delivery and disposal services. Our pooper scoopers will come to your property, pick up, and properly dispose of all dog waste. We never place our haul in your garbage, taking it with us to be disposed of in accordance with local ordinances. We provide spring clean-up, one-time service, weekly, bi-weekly, monthly service or on any other schedule of your choosing. Multi-Month discounts are available. Don’t mind picking up the dog doo, but don’t know what to do with your poo? We also offer bucket service where we provide you the bucket and you do the scooping. We will periodically come to your property to remove and properly dispose of the collected feces, leaving you a clean bucket. Don’t forget a about the kitties! Scoops Pet Waste Management also offers litter delivery and disposal service. We provide you with a weekly supply of cat litter and a bucket. Throughout the week you manage the litter box. Leave it to us to properly dispose of the used litter and deliver you a fresh supply. The litter service includes 25 lbs. of your choice of clumping or clay litter delivered every other week. No matter what service you select, we guarantee your satisfaction or we will re-visit your property within 24 hours. Want more time with your family? Less stress? How about a clean lawn for your pets and children? One less chore will feel like a wieght lifted off your shoulders. Lawn Poolice - Pet Waste Removal Service is your answer! It's simple: we walk your yard, scoop your dogs poop and take it with us. No more scooping in the freezing cold or boiling heat. No more smelling poop in the garbage which attracts insects. Call us today to see how you can be added to our list of happy customers. 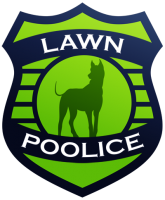 Lawn Poolice is a fully insured, family owned professional pooper scooper company. Weekly, monthly, just one time and everything in between - you set the schedule! We have no contracts so you can cancel at anytime. We also offer a 200% satisfaction guarantee: if you're not happy with our service, we'll re-clean for free. If you're still unhappy, you'll be refunded 100% of your money. No questions asked! Spend more time with your pooch and family. We'll do the heavy lifting for you! Milwaukee County, Racine County and Kenosha County. Need a Pooper Scooper in Milwaukee, Racine or Kenosha? Do you have an overPOOPulation of dog piles? Is your back yard an epic POOPortion of pet waste? Let us help! 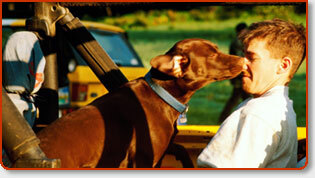 WE ARE A DIVISION OF WISCONSIN’S HIGHEST AWARDED IN HOME PET SITTING - _Wisconsin Pet Care LLC_ . Our awards, reviews  and client services speak for themselves. We are dependable, reliable and hard working folks, just like you, only we have time to clean up your yard! Wisconsin Poop Cleanup is owned and operated by Lori Mendelsohn Thomas, the owner of the highest awarded pet sitting and dog walking company in Wisconsin, Wisconsin Pet Care . Lori takes tremendous pride in her work, her word and her commitment to client services. Either it be pup care or poop pickup - WPC strives to deliver an unprecedented level of service and integrity second to none. We invite you to call us with questions, how things work or any other need you may have. We realize that your precious time is valuable and we will do our best to make your life easier. Let us remove your unwanted waste and make your back yard a joy to behold! Our business hours are Monday to Friday from 8 am to 6 pm, and on Saturday from 8 am to Noon. Cleanup hours will be on Friday evenings and all weekend. If you have a specified need, please contact us to schedule. We offer easy, online scheduling and can offer a "set it and forget it schedule" to make your life that much easier. We take all major credit cards. Puppy Pooper Scoopers picks up pet waste from yards all over the Greater Milwaukee area including West Allis, Greenfield, Greendale, Franklin, Hales Corners, Wauwatosa, Brown Deer, River Hills, Cudahy, St. Francis, Oak Creek, South Milwaukee, Shorewood, Fox Point, Whitefish Bay, Bayside, Glendale, New Berlin, Brookfield, Elm Grove, Muskego, Sussex, Butler Germantown, Menomonee Falls, Mequon/Thiensville and of course Milwaukee. Puppy Pooper Scoopers is a professional pet care cleaning company that picks up the waste your dogs leave behind at residential homes and commercial places of business / public parks in the areas of Milwaukee, Ozaukee County and Waukesha County, Wisconsin. No need to concern yourself about stepping in your pets feces anymore with routine cleanings you can count on. Year round as well as spring cleanups if you have fallen off keeping up with your dogs routine during the snowy season. Big cleanups or small ones, one time only or ongoing multiple times a week, the services are available as you need them. All services can be ongoing and prescheduled on the same day(s) of the week. Prices can be viewed at the website and senior and service dog discounts at times can be made available. Please inquire. Canine Waste Management is an independent dog waste removal company owned and operated by Peter Trapino and Julie Vongrassamy. The company was born from Peter and Julie's own struggle to balance work, household chores and caring for their own canine family members. Peter and Julie repeatedly ran into two obstacles: picking up their dog waste in a timely manner and disposing of it in accordance with City of Madison dog waste disposal regulations. If collecting and disposing of dog waste was so difficult for them, how many others faced the same challenge? At Canine Waste Management, we pick up and dispose of dog waste in your yard. With one simple call, one of our field specialists will stop by your home, scoop, bag and ship all your dog's waste to a location where it will be disposed of in accordance with city guidelines. Our Dog Waste Pick-Up and Removal service can be scheduled at any time you need it, no matter how many dogs you own or the size of your yard. We can come to your Ozaukee County home any day of the week and just in time before you mow the lawn. We do not require a weekly contract so you pay for the service when you need it and not when you don't. Happy Dog Yards LLC was created in December 2006. It is owned and operated by Brad and Kris Erickson. We live in Westby WI and we service La Crosse and all of the Coulee region. We decided to start this business because of our three kids. They all got dogs for Christmas and we did also. One of them couldn't be happy with just one so she got two. Well that is a total of five dogs. So who do you think got to clean up after these dogs? Brad won the job. So I got to thinking who I could get to clean up fifteen piles of waste per day on the average. By the way that comes out to approx. one hundred and five piles a week. Well I couldn't find anyone to do it. So I decided to start my own business cleaning up piles of waste. I would like you to know that we are Dedicated to helping keep your yard and our community clean and enjoyable for all. Wisconsin Dog Poop Pickup Services? Yes! If you consider spending your weekend shoveling smelly, wet dog poop in the backyard as time well spent, well let’s just say I’ve got a job for you around my own home. Seriously, if you’re feeling just to pooped to scoop the “canine landmines” your pets leave around the backyard, consider hiring a professional Wisconsin pooper scooper to take care of the dog poop mess for you. These pet waste removal companies make life a heck of a lot easier by routinely coming out to your property and picking up everything that your dogs leave behind. Pooper scoopers go where ever your dogs “go”. Seriously. Wisconsin Dog Waste Removal Services cleanup dog poop from properties that vary from small enclosed lawns, to large city parks and community dog runs. From pet friendly apartment buildings and condo complexes, to dog shows and commercial kennels, pooper scoopers are there for you to scoop anything your dog can poop. Contracting a dog pooper scooper service to routinely maintain your pets property free of dog poop is not only a real-time saver for busy dog owners, but is actually a very affordable choice in lieu of doing it yourself. Other interested parties that commonly find this service invaluable are those dog owners who are physically challenged and incapable of consistently cleaning up their pets poop. These dog owners may otherwise feel the need to give up their dogs if it were not for the helpful service of Wisconsin pooper scooper companies. Disabled dog owners rest assured that these dog waste removal companies make certain that their dogs environment remains free of poop and sanitary, resulting in happy, healthy and attentive dogs for their special owners. Free yourself of this distasteful chore by hiring a Wisconsin pooper scooper listed here to routinely service your property. Does peace of mind have a price?